With predictions that nearly £5billion will be spent this Black Friday (November 23), new research has highlighted the popularity of e-tailer Amazon’s shopping extravaganza, as 48% of Brits say they plan to buy from the online retail giant during the sales period this year. 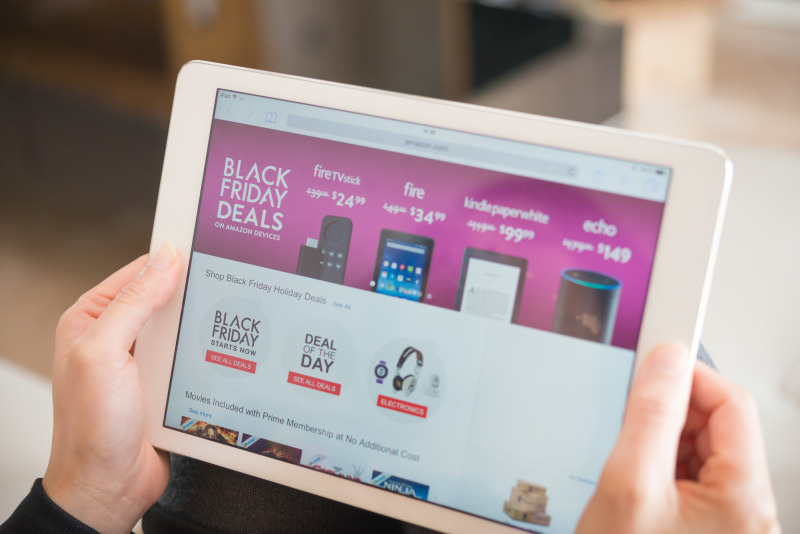 The research from Salmon, a Wunderman Commerce Company, has also shows that 29% of UK consumers are holding back their spending until products become discounted during Black Friday, echoing the findings with both footfall and retail sales. Of the total £4.75billion that is expected to be spent on Black Friday, £2.23billion (47%) is predicted to be spent online. Consumers who are intending to make a purchase on Black Friday, will spend an average of £90 on the day. Whilst men are due to spend 34% more overall than women, Salmon’s research found that women plan to do more of their shopping online (49% vs. 46%). Almost half the consumers Salmon spoke to are most likely to purchase from Amazon on Black Friday, with the figure rising to 59% in the 45-54 year age bracket. This figure wipes the floor with the likes of Ebay where 8% said they would do their shopping, other online retailers, such as John Lewis and Debenhams (15%) or through the website of a specific brand (7%). Meanwhile, Amazon.co.uk says it is preparing for its biggest-ever Black Friday sale, with deals on tens of thousands of Christmas gifts, seasonal items and home and electrical products. As well as discounts and deals online, Amazon is again taking to the high street with its ‘Home of Black Friday' pop-up experience in Shoreditch London. The pop-up shopping event will feature prize giveaways, workshops, cooking demonstrations, and product sampling, and will be open Thursday, November 22 to Sunday, November 25; with doors open to customers for 24 hours on Black Friday. Nearly a quarter of consumers said they will be bringing forward their Christmas shopping to Black Friday to take advantage of discounts and offers. That number rises to 24% for Londoners but drops to a lowly 8% in Norwich. However, according to results the shine of the shopping event may be wearing off for consumers, with 53% saying they have become sceptical about whether certain deals are genuine and represent real savings compared to the rest of the year. Salmon says the results are interesting because many retailers who support the shopping extravaganza now claim Black Friday to be, overwhelmingly, their busiest peak period. Both B&Q and Asda have announced they will be staying out of the race this year and will not run any discounts on November 23, with B&Q favouring its EDLP pricing policy.